Three bedroom, two bath, nice back deck area. 1 king, 2 queen, 1 double, 1 twin bed. Cable and WiFi. Fully stocked kitchen with microwave and new stove, gas BBQ on deck. Triple insulated windows, gas fireplace and complete laundry in cabin. 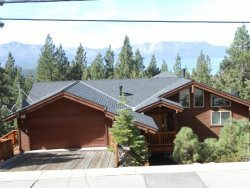 Close to unit V32 for family gatherings Just 4.5 miles from the casinos and Heavenly Mountain Resort, and a mile from the lake. Beds: 1 king, 2 queen, 1 double, 1 twin bed. Cabin sleeps up to 4 only.